HEBREW LETTER: Daleth, door, gate; especially the yoni as Gate of Life. Greek Delta is a triangle, with all it implies. ESOTERIC MEANING: The Luminous Consciousness. It is the substance of that speaking silence (or brilliant flame) that is the instructor in the Secret Foundations of Holiness and of their (stages of) preparation. TANTRIC & ALCHEMICAL SIGNIFICANCE: Alchemical Salt (Tamas). 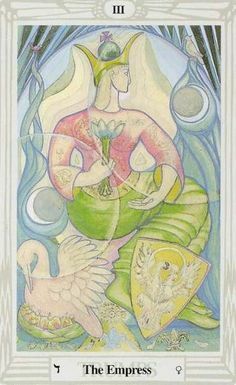 DIVINATION: Love, beauty, happiness, pleasure, sensuousness, fruitfulness, success, completion, graciousness, elegance, friendship, gentleness, delight. But with very bad dignity, it means luxury, idleness, debauchery, dissipation. She is fertility, the matrix of creativity, and the magical imagination. She represents the door through which life and light flow like electricity magnetically induced. Her sphere is all rose and blue--lovely yet deep, gentle but unwavering in her devotion. Her lily staff could not be more upright or phallic, and her posture while reposed is not obviously receptive, other than the arm outstretched ready to cradle some new life (while still comfortably seated on her thone). She is energetic and vibrant like the tide, there is no passivity here, although she is quiet. The cross and sphere at her crown suggest the composition and formulation of the matter the Emperor later holds in hand. She often represents some matriarch, frequently revealing issues with one's feminine side (or mother), especially for males, and might suggest some emergence into adult womanhood (sometimes motherhood) for female querents. To fall to his feet?